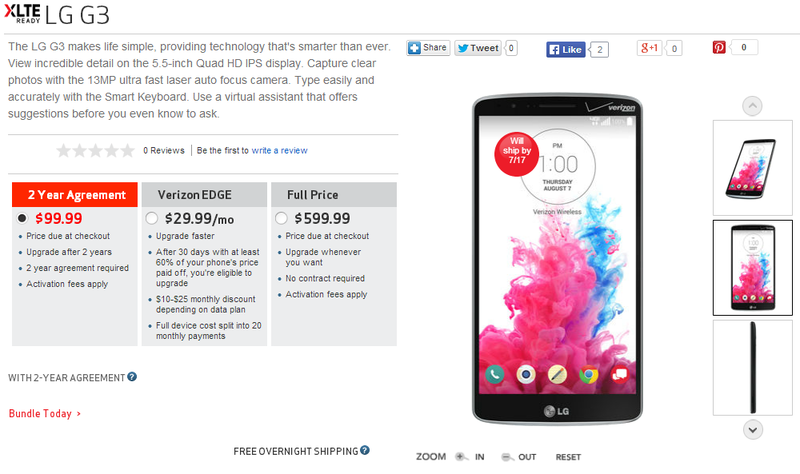 Verizon sure took its sweet time when it came to getting LG's latest flagship phone out. But if you're on Verizon and you've been salivating at the admittedly awesome G3, Big Red is now ready to your money. The G3 will go on sale next Thursday, July 17th, but you can pre-order it on the website now. The two-year contract price is $99.99, the off-contract price is the usual $599.99, and Verizon will let you split that up with its EDGE system if you'd like the option. Whoever does the US branding for Verizon must be a beast, because they can push around international electronics manufacturers like nobody's business. Just like the G2 last year, Verizon's G3 is the only carrier variant with a logo crammed onto the front taking up a huge chunk of the top bezel. It's also worth noting that this is the 32GB model, which comes with 3GB of RAM (the cheaper 16GB version, which Verizon apparently isn't selling, only has 2GB). Other specifications, including a lust-worthy 5.5" 2560x1440 screen, a Snapdragon 801 processor, and a 13MP rear camera with optical image stabilization, remain the same. The G3 should be in most if not all Verizon corporate stores next week, which is where I would go if you're not interested in waiting. (That's corporate stores, not the little hole-in-the-wall resellers that use Verizon branding and usually don't carry much in the way of real stock.) At the moment Verizon is offering the phone in black and white colors, though that may change at some point. Verizon will also be selling the Android Wear-powered LG G Watch, though it hasn't hit the website yet. ENGLEWOOD CLIFFS, NJ, July 10, 2014 – LG Electronics today announced its latest flagship smartphone LG G3 for Verizon Wireless is now available for pre-order and will be on sale in stores starting July 17. LG’s Android Wear smartwatch and perfect companion to the LG G3, LG G Watch, is now also available through Verizon Wireless. Starting today and for a limited time, Verizon Wireless customers can pre-order the LG G3 for $99.99 in Metallic Black and Silk White with a new two-year activation onlineand in Verizon Wireless Smart Stores. On Verizon Wireless, the LG G3 is XLTE-ready, giving customers faster peak speeds and greater network capacity nationwide. LG G Watch is available for purchase online starting today and in stores on July 17 for $229.99. When paired with a premium Android smartphone, such as the LG G3, or any other device running Android 4.3 or later, the LG Watch provides useful information accessible right on the wrist. 5.5 Quad HD display with four times the resolution of any other available mobile HD screen in the US. For more information and to order LG G3 and LG G Watch for Verizon Wireless, please visit www.LG.com.